Color-wash whole house fronts or dim the light for a refined in-door lighting. The Mood Light™ Color Beamer is a LED strip light that can be used in a variety of ways. For architectural design or decorative lighting, the Mood Light™ Beamer will fill the surface it is aligned to with a myriad of colors. Switching up to 256 Mood Light™ Color Beamer units with an individual length of 33cm in a row, you can cover a stretch of over 100m with only one power supply. Approved water-resistance allows for delicate and playful combinations of water and light. Illuminated fountains and waterfalls are only a few of the scenic surroundings for the Mood Light™ Color Beamer. DMX controlled, the Mood Light™ Color Beamer offers infinite programming possibilities for controlling the speed, functions and sequences displayed. For unconventional interior and exterior illumination with the sensational feature of changing or pulsating light. The Mood Light™ Color Beamer will transform any room or outside wall into an overwhelming display of infinite color and light. 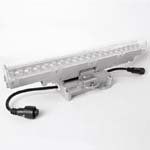 For use with PC we advise the Enttec DMX controller or DMX4ALL interface.